Hello and welcome to a new series of articles which will explore the wisdom to be found in classic children’s books! Some of you have graduated and the rest are eagerly awaiting (probably not) the start of the new academic year. Due to this, the aim of this series is to provide a bit of insight, inspiration and general life advice to students, graduates and everyone else! At this point you may be thinking that’s all very well, but why children’s books? Aren’t they just outlandish stories and bright colours that serve to keep kids entertained just before bed time? Yes…and no. “Perhaps you will forgive me if I turn from my own feelings to the words of another splendid bugger: W.H. Auden” – he said “there are no good books which are only for children”. Auden was a poet and is widely considered to be one of the greatest writers of the 20th century, and of course, his sentiments here are the absolute truth. The books we read/were read to us as children enthralled us, captured our imagination, made us wonder, made us dream, made us laugh, made us smile, inspired us and of course sent us off to sleep in the best possible way. And it is very likely that you still have a fondness for those books to this day. They stayed with you, and they did so for a reason. As children, we don’t have the cognitive capacity and experience to understand the true depth of the words being used. Therefore the books function well on an entertainment level when we are children, and only in adulthood do we realise the books are rarely as simple as they once seemed. This idea is even the backbone behind an exhibition at the New York Public Library, ‘The ABC of It: Why Children’s Books Matter’, which explores the social, historical and artisitic importance of children’s books over centuries. Children’s book historian Leonard Marcus, the curator of the exhibition, sums up the importance of children’s books in one fine sentence – “they are the message-in-a-bottle that each generation tosses out to the next generation”. Hence I believe they are a fine source of timeless wisdom, for children and adults alike. In addition to housing the finest evidence for why children’s books matter, The New York Public Library also houses the focus of this particular article: the bear of little brain with a tummy full of ‘hunny’, Winnie the Pooh! A.A. Milne, creator and writer of the Winnie the Pooh stories, often said his writing was not just intended for children. Therefore, I think his work is the perfect place to start with this series. The original stuffed animals which belonged to A.A. Milne’s son, Christopher Robin Milne, that inspired the Winnie the Pooh stories. They have been housed at the New York Public Library since 1987. Christopher received Edward Bear (later renamed Winnie the Pooh) on his 1st birthday. You’ve all heard the old adage that breakfast is the most important meal of the day. However you may not know it is especially important if you are trying to learn something and be productive (that’s what students do anyway right?). A study by Baumeister and Alquist, 2009 showed than when we are hungry, it is harder to control unwanted behaviours. So essentially, this means less focus and more procrastination! Not ideal if you are trying to get something important done. Researchers at Leeds University have been studying the effect of breakfast on the academic performance of children. And of course they found that kids who had breakfast had better analytical skills and performance throughout the day than those who skipped breakfast. There is a lot of data out there which conclusively proves breakfast is the most important meal of the day, and it is handily summed up in this infographic and this one too. One particularly relevant piece of research illustrated in the infographics suggest that students who eat breakfast have better grades than those who don’t – so that is reason enough to never skip it! On a similar note, tea solves everything! “There there,” said Piglet. “I’ll bring you tea and honey until you do. This one doesn’t need backing from studies, you know it’s true! But here is a study anyway from UCL to illustrate that yes, tea actually does reduce stress in times of crisis. Tea even diffused an EDL protest a few months ago! If you want something, go get it. Nothing at all will land in your lap without hard work. It’s easier to drift along with everyone else than it is to push out of your comfort zone and make things happen. You don’t like your circumstances? Do something about it. If you fail it’s a lesson and at least you can say you tried. Don’t allow yourself to get to your 50’s and say well I could have done this, I could have done that – now is your time to do what you want and build things the way you want them to be. As Chris Addison said for his second point in the above speech: “If it doesn’t exist, build it. If the opportunity that you want, the position that you want to get doesn’t exist, if nobody’s prepared to give it you – build it for yourself”. Go for the speculative PhD or job application option if you can’t find anything that interests you, do lots of voluntary work, build your skills, build your experience – anything that’ll move you, even an inch, towards where you want to be. Whatever you want, build it. This is your life and you have the ultimate control over it. Don’t write to be fancy and impress. Write to be concise and precise. Writing with the fewest words possible is the best way to get an idea across. To help you with this, here is a list of long words, phrases and redundancies and their many shorter alternatives. Using bigger words, when writing or speaking, does not make you seem smarter either, in fact research shows it has the opposite effect. The classic book on writing, The Elements of Style, reminds us that it is always better to use short words where they will work. This book is invaluable when it comes to any form of writing at University and also post-university, so do check it out! Behold The Elements of Style rap below! That’s all the advice for this week! The next part of this series will be up in 2 weeks, with some more exploration of Winnie’s wisdom mixed with a lot more psychology and science. That’s right. 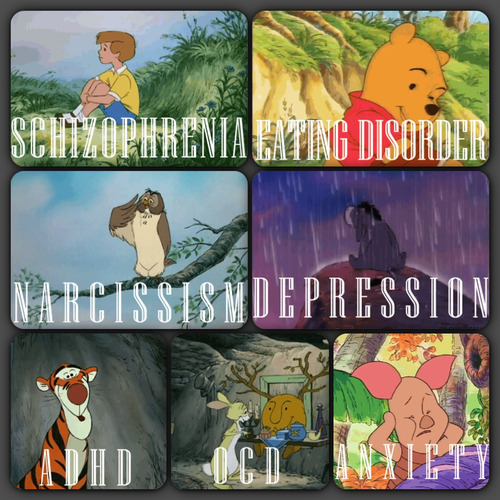 There is a well known theory that has been floating around for years which states that all of the characters in the Winnie the Pooh stories represent different Mental Health Disorders. This all started back in the year 2000 when a paper was published in the Canadian Medical Journal examining the inhabitants of Hundred Acre Wood from a neurodevelopmental perspective: “On the surface it is an innocent world but on closer examination by our group of experts we find a forest where neurodevelopmental and psychosocial problems go unrecognized and untreated”.